St. Mark's presentation of blind Bartimaeus is full of wonderful ironies. Most plainly there is the classic irony of the blind person being the one who can actually see; after several episodes in which the disciples address Jesus with incomplete titles--e.g. master, teacher, rabbi--this blind beggar finally calls upon Jesus with all of his saving and royal dignity: "Son of David, have mercy on me!" In their arrogance and presumption, James and John had approached Jesus and told him, "We want you do for us whatever we ask of you." Now Jesus addresses Bartimaeus in a similar way: "What do you want me to do for you?" An authentic encounter with Jesus, i.e. prayer, always becomes an encounter with the desires of the heart. If our desires are distorted we can expect, like James and John, to receive a jarring challenge in response. If our heart is in the right place we will hear the words Jesus gives back to Bartimaeus: "Go your way: your faith has made you well." The end of the healing experience matters as well. Right away the newly sighted Bartimaeus follows Jesus "on the way." Here we see the difference between Christianity and the 'spirituality' of the world. A worldly, so-called spirituality offers healing so that we might enjoy ourselves. The end of being healed in Christ is discipleship; we are restored in Christ so that we might follow him on his Way. A month ago a certain important friar gave a short homily on a certain important occasion. I heard it myself. A few weeks later I was given the brother's text to make a translation into English that could be published within the Order. This written text, of course, was not exactly the same thing as the homily I heard when it was given. There's nothing strange about that; when I was a parish priest I would always write out my Sunday homilies, but mainly just to consider structure and length; the homily I would actually deliver on Sunday (without my text) would be more or less the same thing, but not exactly. Since then, for other purposes, I have twice been given parts of this same homily to translate, quotes which presumably derived from someone else's hearing and/or transcription, because they didn't match the written text I had previously seen. Nor did these other transcribed sections match up exactly to my own memory of the homily I had originally heard, though the idea was more or less the same. More or less. Again, this homily happened only about a month ago. And it has passed through just my experience in four variations, three of which are doubled by translation into another language. So what was really said? And what does such a question mean? What assertions, hopes and grievances are embedded in the question? And what if we were talking about a homily given two thousand years ago? "My siblings and I can't even agree on the historical grandma Mooney." Most High and Glorious God, I am unworthy to approach you in any way. But my trust in your mercy softens my fear of your judgment. From the very knowledge of my sins and my wretchedness, those things which render me unfit to offer you sacrifice, comes the awareness of my need for the healing and strength that flows from your Sacrament. And my consciousness of this dire need overcomes my fear of committing sacrilege by presuming to offer the Sacrifice. For the Sacrifice I offer you isn't my own, but the Sacrifice of your Son, who, through the consent of our most Blessed Mother, has joined to his divinity my humanity, letting it be baptized in the Jordan, broken on the Cross, and raised into the new creation of the Resurrection. By this Mass that I offer to you, and by the Holy Communion with which you nourish me, may this sick old man--already drowned in baptism--die more definitively, and may the new creature be born anew, again for the first time, ready to give his body, his self, for your people. For Pope Blessed John Paul II today, it was my turn to be the principal celebrant at Mass. It seems to be the custom here only to really preach on days that rank at least a liturgical feast (como Dios manda), but often the friars say a little something at the beginning as an introduction to the Mass. So I had been thinking about what I could say for today. Poking around a little, I was reminded that one of the first things John Paul II did after his election was visit the basilica of St. Francis. He is, after all, the patron of Italy. "Be servants of his people gladly, because St. Francis wished you to be joyful servants of mankind, capable of lighting everywhere the lamp of hope, trust, and optimism which has its source in the Lord himself. May your, our, common Patron Saint, St. Francis of Assisi, be an example to you today and always!" Follow this link for your second reading for the Office of Readings today. Today the Martyrology reminds us that it is a special feast for all of us who are adopted children of Abraham through Jesus Christ, and not members of the Israel of history. The commemoration of of St. Cornelius the centurion, baptized by St. Peter the Apostle, the first of the Church out of the gentiles. Those are the current postulants from my province of the Order. I was impressed with their work in the video. A couple of things in particular struck me. First, the saints. Why join the Capuchins? Because the Order has produced so many saints and blesseds. That's a great answer, and one that I would have been too ignorant and self-involved to think of when I was first entering religious life. It reminded me of the conversation with Robert Lax recalled by Thomas Merton in which Lax challenges the newly-baptized Merton to want to be a saint. To be a 'good Catholic' was hardly worthy of human desire; one ought to want to be a saint. And in fact, said Lax, it was a very simple thing; one only had to want it. Second, prayer. I'm encouraged by their emphasis on prayer and it calls me back, making me remember some of my first love and fervor in this life. It brings back to me the greatest compliment I have ever received: when I was applying to the Capuchins one of the things I needed was a recommendation from my pastor. I had been a parishioner of St. Lawrence in West Haven, Connecticut (I lived right near the church on the corner of Main and Washington) but I didn't know the pastor very well. I had hardly spoken to him, apart from the occasional confession (I usually went to the Dominicans at St. Mary's.) But when I approached him to explain that I was applying to religious life and to ask for the recommendation, he said that he would be happy to do it. He said that I seemed to 'have a desire for prayer.' That might be the most encouraging thing anyone has ever said to me. After all, a desire for prayer is nothing other than a desire for God, for prayer is nothing other than our surrender to the life of the Blessed Trinity and his holy manner of operation within us. By our baptism we are folded into the Dynamics of the Source, the Father eternally speaking the Word by the breath of the Spirit, the Son praying through the same Spirit back to the Father. And if the desire for prayer is nothing other than the desire for God, the desire for God is the same thing as the desire to be a saint. At supper tonight I was sitting with some of my fellow language secretaries. The brothers were making fun of the Secretary for Portuguese, because, as much as I can gather, he has been at the work for a long time and had announced previously that he would be finished on a certain date. So of course the friars then never cease to remind him that the date has passed and he is still here working away. "Let's not scare Charles. He's new." To which I protested that I in the explanatory letter from the Minister General accompanying my letter of obedience, it was explained to me that I was to come here to Rome for a year of prova, a testing out of things, after which there would be a conversation about what to do next. I was here for a year, I said, and then we would see. "We all received that same letter. And this one has been here for five years, this one for fifteen..."
Another younger friar of the curia, from Poland, concurred. I protested again. I have a letter, I said, and this is what it says. The table turned to a slightly older, more experienced friar at an adjacent table, and asked him what he thought of this business of the letter. "The letter kills," he said. Ecce mundus sacerdotibus plenus est, sed tamen in messe Dei rarus valde inventur operator, quia officium quidem sacerdotale suscepimus, sed opus officii non implemus. "Behold, the world is full of priests, but a real worker in God's harvest is rarely found, for we have taken up the priestly office, but the works of the office we do not fulfill." I have asthma. I've had it forever. It hardly ever gives me any trouble, but I do need medication. So of course one of my 'things to do' at my landing here in Italy was to figure out how to get some asthma meds. When I came here to the curia, I saw that on the occasionally posted notices of upcoming community events it often said, dovrebbe venire il dottore. "The doctor should come." So, I said to myself, when he comes I'll talk to him. I'm not being chauvinist, presuming that the doctor was a man. In Italian, a doctor who is a lady is a dottoressa. So I marked the day on my calendar. When it arrived, I asked the guardian at breakfast if the doctor was coming. He told me that he was already here and that I had better hurry or I would miss him. I was taken down a hall to a room and told to wait outside. Someone was in there, I was told. When the other brother emerged, I went in. The doctor was all business; not quite gruff but certainly without any pleasantries. I explained to him that I was new, that I was an American, that I had asthma, and that I needed medicine. I gave him empty packages of American Symbicort and generic albuterol. "Symbicort. We have that here," he said, and filled out a prescription form. The word in Italian for 'prescription' is ricetta, which is also 'recipe.' That says a lot, believe me. The albuterol, however, seemed to stump him a little. He took out an Italian drug reference handbook and gave it to me, saying the writing was too small for him to read. "See if you can find it. It's probably 'albuterolo.'" Italian is funny that way. It wasn't there. But he wrote the prescription anyway. "Take this to the pharmacy. Maybe they know what it is, or what it's called here, or something else that's like it." O.k., sounds like a good plan, I guess. Here, try this drug, see what happens. Then, with my two prescription forms, the doctor dismissed me. When I next saw the guardian, I asked him if we had a pharmacy that we used. He explained to me where it was, and told me to ask someone to take me in the car when I wanted to go. But because I'm independent and enjoy these little solitary adventures (light side) and have a hard time asking for help (dark side) I decided to walk. On Google Maps it looked like it couldn't be more than three miles, and besides, I would certainly encounter some place where I could but a bus ticket if I wanted to come home that way. Plus, I would get to know the neighborhood a little bit. The walk turned out to be a disappointment. The occasionally impassible sidewalk forced me to risk life and limb in the street. Then there was the awkward moment of passing the weary-looking prostitute sitting on her little chair by the side of the road. I should greet her, I thought, to recognize her humanity is a work of love and chastity. But what to say? Buongiorno? Seems wrong somehow. Ciao? No, no. Salve? No, no, too stilted. I couldn't decide. I just smiled a little. After an hour's walk through almost nothing interesting, I arrived at the pharmacy. I was a little concerned when I looked inside. A lot of the customers were in there with their dogs. And I saw what looked like veterinary products. But I also saw toothbrushes and skin lotions. Could the dog pharmacy also be a people pharmacy? I was going to find out. So I took a number. In Italy you always take a number. The pharmacist I got was very nice. Just like the doctor said, he gave me something else that he said should be the sort of thing that albuterol is. I haven't studied it well enough yet to make my own conclusion. Apparently, or so I'm guessing, the other prescription said that I was supposed to get two canisters of Symbicort, but the pharmacy only had one. So the pharmacist made me pay for two and told me to come back tomorrow for the other one. Big deal. Three or four euro for a month of medication? This is when socialized medicine feels good. But now I have to wonder what 'tomorrow' means in Italian. It probably doesn't mean the actual day after today. So now I have to decide when to back to try to get my other Symbicort. Not wanting to repeat the bleak walk, I took the bus back. On the way back the chair where the prostitute had been was empty. From time to time I'll see something ranting against celibacy, saying that it's a pathological choice or at least can't be healthy, etc. It seems to me that these usually fall into the kind of black and white thinking that doesn't take seriously the work of grace. Sure, some people take up the celibacy of religious life or the priesthood for imperfect reasons, and even from pathology. And, of course, some celibacies end in disaster and suffering not only for the would-be celibate, but also for others, as we know all too well in our time. In religious life one has the joy of seeing old celibates for whom the charism has worked as advertised, having broken them open to a chaste and non-exclusive love for the world which reflects the love of God in its own particular way. But one also gets to see the celibacies that have gone wrong, leaving celibates dried up in an affective dead-end. One can say the same things, mutatis mutandis, of marriage, or of any vocation we enter into with every good intention, but as the wheat and weeds of our blessed and broken selves. The danger is to think that reasons and motivations are all good or all bad. We are mysterious messes, made of the goodness in whose image we are created together with the festering and rotten injuries left by the effects of sin. Can God call us to the vocation he gives us for our salvation--and for our chance to participate in his salvation of the world--as this total person? In other words, can God call us to our vocation with both our good reasons and bad for our attraction to the choice, with both our sanctity and our pathology at work? Yes. It's called redemption. When it works, when someone succeeds in surrendering to this work of salvation, it's a truly blessed and amazing thing. Pathologies are flipped, turned inside-out--pick your metaphor--by the opportunities for grace and growth that the vocation brings and become gifts given for the encouragement of others and their salvation. Just because it sometimes doesn't work when we don't succeed in surrendering to grace, just because sometimes pathology swallows up what would have been sanctity and uses it for its own rotten and meaningless ends, that doesn't make it the fault of the vocation. My first two visits to Italy in 1992 and 1993 were days rich with stories and experiences. Twenty years later, as I settle in to living here, it's fun when something recalls one of those earlier moments. There was one on one of my last days of Italian school when a funny little word came up, a word with which I had a history: etto. In the spring of 1993, when I was alleged to be studying philosophy at University College Galway, we had almost a month off around Easter. So, naturally, we Americans all strapped on our backpacks, got on the boat at Rosslare, arrived the next morning in Cherbourg, and wandered into the Continent. My group was three when we started; me, this girl Beth, and this kid Travis who was a student at Marquette. I have no idea what happened to him, but I would be curious to know. Beth got sick of us after a few days and went her way. At one point another girl joined us, Christine of Minnesota, whom we met--if I remember rightly--because I saw her brushing her teeth in the street in Munich and thought that made someone interesting. She was charming and liked to drink strawberry milk, but she also ditched us after a little while. Towards the end of our wanderings, Travis and I found ourselves in Italy. One day he announced that, being in Italy, he would like to have some Provolone cheese. It was one of his favorite cheeses, he said. We were somewhere, I don't remember where, when we came across a cheese shop. Neither of us, however, spoke any Italian. How were we to know how to ask for some cheese? Travis, I know not how, thought he knew how to ask for a little bit of something. You asked for an etto. So that's what he was going to do, go into the cheese shop and ask for an etto of Provolone. 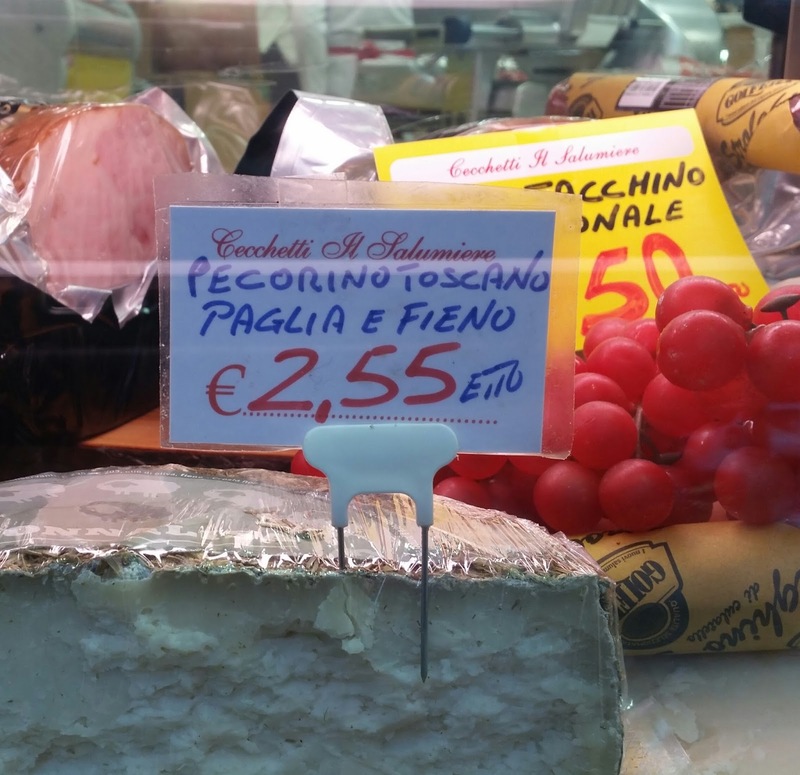 Now I'm sure the formaggiaio at the cheese stop spent much of his life being asked for an etto. It's short for ettogrammo, meaning 100 grams. It's a common enough word in the realm of food shopping. But it's not the kind of word you learn in language class. As my mother says, after years and years of foreign language study, when you can interpret poetry and discourse on the classics of its literature, you still won't know how to buy a pork chop. Once you've studied Italian a little bit, it's easy to see right away that etto is how it would render the prefix we have in English as hecta-, from the Greek hekaton, a hundred. Although I don't know why anyone would bother leaving the house to buy 100 grams of cheese, unless virgin elves had made it out of unicorn milk or something. On the other hand, I guess I've seen people buy quarter-pounds of things at the deli counter. That would be just a little more than 100 grams. But still, it seems pretty measly. Tuscan Pecorino, € 2.55 for an etto. Pricey! So there we were, stuck with this big hunk of Provolone cheese, which was very good, by the way. So we ate it over the next couple of days, buying loaves of bread wherever we were and making sandwiches. Now in Italy it's easy enough to find and buy a loaf of bread. But you have to know the critical difference, obvious to Italians but somewhat lost on us at the time, between the sort of place that sells loaves of bread and the sort of place that only sells bread already made into more complex things like sandwiches. "Bread and salami, bread and cheese, no bread!" At supper two friars were discussing the ministry of being guardian of a house. One of them had been a guardian before and the other not. The one who had been a guardian said, "Well, you're almost right, but for a small change in point of view. It's more like you say to one friar, 'why did you go there?' and to another, 'why did you do that?'" During the months of May and October here at the general curia, the common meditation period between vespers and supper is given to the rosary. It seems to be the custom here to use the prayer at the end of the decades: O my Jesus, forgive us our sins, save us from the fires of hell, lead all souls to Heaven, especially those most in need of Thy mercy. Amen. Of course here we say it in Italian: Gesù mio, perdona le nostre colpe, preservaci dal fuoco dell'inferno, porta in cielo tutte le anime, specialmente le più bisognose della tua misericordia. Amen. I remember encountering this prayer for the first time when I was a catechumen and I went to a rosary at the parish where I was going to be baptized. It wasn't, however, present in the little booklet from which I first learned to pray the rosary, and so I've never really adopted its use. Besides, I'll admit it, when I was younger it seemed to me a little patronizing the part about the souls in most need of Jesus' mercy. Here we were, righteous rosary-saying folks (and we all know that praying the rosary is one of the marks of an extra-good Catholic) praying for those poor souls in most need of mercy. Over time, though, I've come to realize that it's not that way at all. Why? Because when I pray for Jesus' mercy on the souls most in need of it, I'm praying for myself. That's me, Jesus, the soul most in need of thy mercy. Even if someday I get to the point where my sins aren't as objectively grave as some of my brother and sister sinners in this world, I will be still a worse sinner because I persist in my sins and spiritual laziness even with everything God has given me. So I've decided that I'm happy to say the prayer. And I'm grateful for everyone else in the world praying it for me and my fellow souls most in need of Jesus' mercy. I appreciated St. Ambrose in the Office of Readings today, from his treatise on Cain and Abel, as he explicates the Lord's teaching on prayer from Matthew 6:6: "But when you pray, go to your inner room, close the door, and pray to your Father in secret." Sed intellege non cubiculum conclusum parietibus, quo tua membra claudantur, sed cubiculum quod in te est, in quo includuntur cogitationes tuae, in quo versantur sensus tui. Hoc orationes tuae cubiculum ubique tecum est, et ubique secretum est, cuius arbiter nullus est nisi solus Deus. "But [by this 'inner room'] do not understand a cubicle bounded by walls in which your body can be enclosed, but the cubicle which is inside you, in which your thoughts are kept and your feelings turn over. This is the cubicle of your prayer. It is with you everywhere, and everywhere it is a secret. In it there is no one to judge you but God." It's a pity that 'cubicle' in English is such an impoverished word, conjuring up images of drudgery, claustrophobia, and conformity. Because of the way we use it, it's easy to think that it comes from the word 'cube.' In fact, 'cubicle' derives from the Latin verb 'cubo, cubare,' to lie down. The cubicle is the little room where you lie down, your bedroom. The place of prayer is an inner place, a space in which our spirit can 'lie down' and relax, because no judge but God has any access. Prayer, and indeed any of our attempts to relate our person to another personality, whether divine or human, depend on our awareness and cultivation of this space, of our inner cubicle. If we have forgotten about it or neglected it, we will not experience ourselves as a being separate enough from others in order to relate to them as a distinct person ourselves. Our relationships, including our prayer, become fawning, aggressive, or unchaste because we have ceased to be a self in relationship but only a consciousness reacting to another as another object. By cultivating our awareness of our own inner cubicle, and the life of relaxation in it we call prayer, we also practice our mindfulness that the core of the other is also an inner cubicle. This is the root of genuine prayer on the one hand, and of charity and chastity in our human relationships on the other: the awareness of ourselves and each other person as rooted in an irreducible mystery to which only God has access. Over the course of my religious life, during some spells I've had to cook and at other times not. For the most part, even though one always faces with the friars the challenge of a diverse group, I've enjoyed cooking for them. It was a bit of a shock when I first started cooking for friars; what little I know of cooking I had learned during the period between my two times in religious life, when I was either preparing things just for myself or cooking at work in the group home. The folks who lived there, apart from being predictable and somewhat easy to please, were also non-verbal and so delivered few comments. Over the last few months of living in Italy I've come to notice certain items of wisdom in the culture of preparing and eating meals here, at least with reference to my own experience of cooking for friars. In Italy, of course, one eats well. It has to be admitted that they just have a healthier food culture than we do in the States; lots of fruit and vegetables, a better sense of portion control, etc. Lots of everyday things are just always very good. It also has to be said that they do lack a sense of when a little heat and flavor from some hot sauce or pepper would do wonders, but thanks be to God I live with Indians who feel the same way and usually have some remedy at hand. First, this business here of having the main meal in the middle of the day. I think of all the afternoons I've spent preparing dinner in a friary. How would those hours and those meals had been different if, instead of the afternoon, I had been cooking in the morning when the mind is sharper and the spirit more optimistic? Perhaps the meals would have turned out better or healthier, more sensible. Just a thought. Second, the meal structure they have here of the first and second plate. I've cooked pasta for the brothers many times. It's easy, it's a crowd-pleaser, and leftovers tend to get eaten. The only stressful thing is the timing. I can see myself outside the door of a friary chapel listening for just the right moment during vespers when I should run back into the kitchen and put the pasta in the water such that it might be done, sauced, and on the table right when the brothers arrive. In itself that's easy enough. But when you're trying to look after the timing of other stuff in the same moment, the resting and carving of some meat or other for instance, that's when it gets crazy. What happens if the 'just right' moment to carve the roast is the same as the 'just right' moment to take the pasta out of the water and put the sauce on it? There's nothing for it; an imperfection creeps in. And therein I see the wisdom of the Italian cook, who can time these things in different intervals, dealing tranquillamente with the roast or what have you after the pasta dish is already being enjoyed on the table. Yesterday morning some brothers came to collect me from Garbatella and bring me, at last, here to the General Curia. I'm not quite landed yet, though. The room which is to be mine isn't ready, so I'm in a guest room for the weekend. Wandering around the Collegio, I met some students. In the course of meeting them, one asked how old I was. I told him that I was forty. "As Moses fled to Midian when he was forty, so you have come to us." At supper, one of the brothers was--I think--accusing another of feigning ignorance of certain significances of the recently concluded general chapter. "Are you the only foreigner in Jerusalem who does not know about the things that have happened here in these days?" Looking forward to this morning, for which the gospel is Jesus' teaching on marriage in Mark 10, one of the brothers quizzed the friar who was scheduled to preach. "What will you say tomorrow? Are you going to tell us that we may not abandon our wives?" "We have never been as close to our death as we are right now, this morning." If I understood correctly, after four months of living out of my bags here in Italy (and three in Boston before that), I will be moved to the general curia after my last morning at Italian school on Friday. So now I'm in transition mode: thinking about when I ought to do laundry such that it might be dry in time to pack it up, going to confession, visiting my new friend TIM (Telecom Italia Mobile) to put some euros in my phone, trying not to anticipate going-away salutations and events as a way to be less anxious about them, etc. I have to say that I'll miss this neighborhood where I've been staying since the middle of July. The small community of three or four friars, visiting the Capuchin nuns next door for Mass in the morning, the regular folks doing regular stuff, the friendly Turks at Istanbul Kebab, the crazy store where the Chinese ladies sell everything in the universe, including cheap school supplies for the local Italian student, and the nice girls at Alice Pizza. But probably more than anything I'll miss being so close to the basilica of St. Paul. It's usually a pretty peaceful place to go an pray or just sit, the Blessed Sacrament chapel is a cozy spot, and there's almost always a priest to hear your confession. There might even be a confessor who speaks English, either the Italian monk who speaks just a little but is very willing, the one I can't figure out who hears in five languages and always gives as a penance one of the psalms coming up in the vespers that day (that was easy), or the one whom I think is German and who absolves, I absolve thee from thy sins... Valid and licit? I don't know. Just too cool? Absolutely. Even the Lord himself, when someone boldly announced his intention to become a disciple, warned that the Son of Man had nowhere to lay his head. That's the thing about the journey; at first you think that little by little you will soon arrive spiritually at a peaceful and serene place where you can rest your battered spirit. And it's true in a way. But it's also true that all you find is the way. I once had a very good spiritual conversation with another friar on how much time we waste thinking that we will get our prayer and our spiritual lives together once things 'settle down' or 'get back to normal.' But it's an illusion. There's no such time. There's only the mess, and the only time to pray is now.